Guadalupe-Lamar is highest-density corridor in Austin — according to Project Connect’s own data! Closeup of Project Connect’s central Austin map of population density for 2010 shows intense clusters of density in West Campus, along Guadalupe above W. 29th St., and in Triangle area. Map: Rev. by LH from Project Connect. Even from the peculiarly selective and distorted data exhibited visually in Project Connect’s Map Books, it’s clear that the Guadalupe-Lamar (G-L) corridor currently has by far the highest concentration of population density within Austin central study area (and almost certainly the highest in the entire metro area). And this density appears predicted to persist in ProCon’s projection for 2030! This density (pointed out decades ago by Lyndon Henry and Dave Dobbs as a pre-eminent justification for rail transit in this corridor) is shown in the following map graphics excerpted from the latest version (v. 5) of ProCon’s Map Book. Population density in 2010 (G-L corridor spine in yellow). Map: Rev. by LH from Project Connect. The map above shows the central-city study area (mislabeled by ProCon as a “Central Corridor”) with various sectors (mislabeled as “sub-corridors”) in 2010. The arterial spine of the G-L corridor (the most likely alignment for urban rail) is shown by a yellow line. Notice that heavy concentrations of high population density are clustered around the G-L corridor, particularly in the West Campus area, and just north of the campus, bordered by Guadalupe on the west and W. 29th St. on the south. Population density projected for 2030 (G-L corridor spine in yellow). Map: Rev. by LH from Project Connect. The map above shows the same study area and sectors, with population density concentrations projected for 2030. While these projections are far more subjective and tentative than actual current reality-based data, they do reflect speculation that extremely high density will not only intensify in 2030 in the same areas as it was located in 2010, but is expected to expand to other segments of the G-L corridor. Composite of zoomed-in snips of Project Connect maps of population density. LEFT: 2010. RIGHT: 2030. Rev. by LH from Project Connect. This composite focuses on population density the G-L corridor, showing density concentrations in 2010 on the left, and in 2030 on the right. Again, the probable alignment for urban rail is shown by a yellow line. This makes both the existing density and its projected intensification in the future even more obvious. 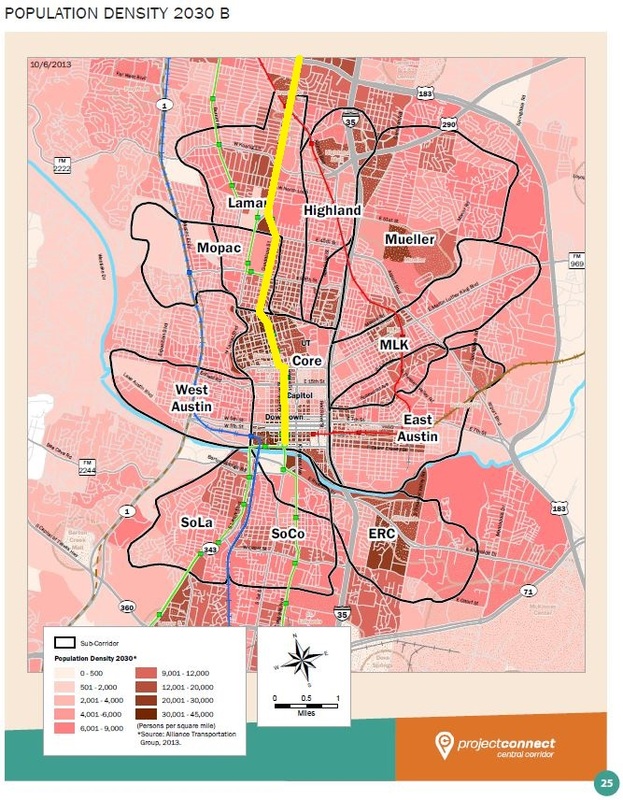 These data visualization maps clearly indicate that not only does the Guadalupe-Lamar corridor currently have extremely high levels of population density (as much as 30,000 persons per square mile in the West Campus) sufficient to support urban rail, but it surpasses all other corridors in the city! Furthermore, even in ProCon’s flawed analysis, this density is projected to intensify by 2030. 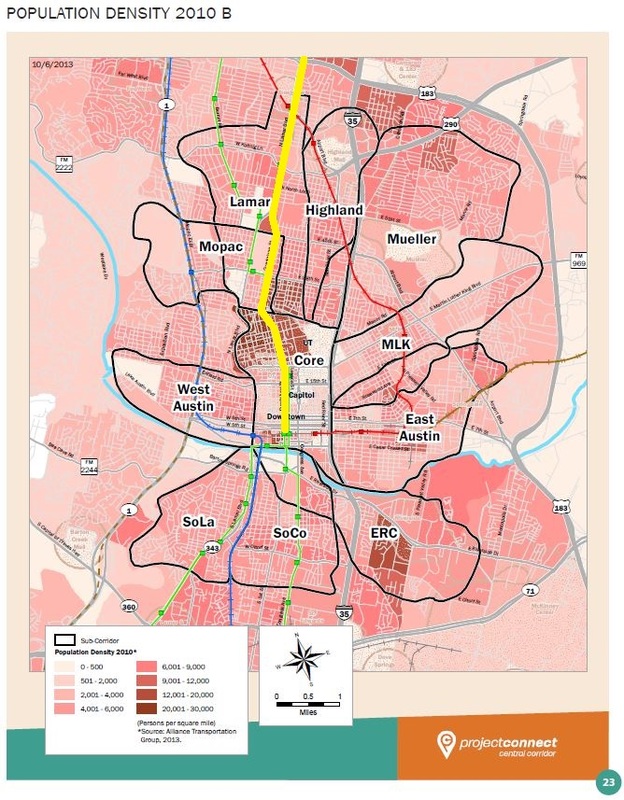 But this kind of bona fide corridor analysis counts for absolutely nothing in Project Connect’s “study”, because they’re not evaluating travel corridors such as Guadalupe-Lamar! They’ve been wasting taxpayer money on largely irrelevant studies of demographics and other conditions in isolated sectors while largely ignoring actual travel patterns in corridors into the core area, along with the demographics and other critical features along these actual corridors, such as G-L.
On Nov. 15th, the ProCon team are due to announce their “recommendation” for a sector (“sub-corridor”) as the location for urban rail … and it’s anybody’s guess as to what is the basis for their evaluation. But this small analysis we’ve just presented illustrates the actual kind of analysis of a travel corridor that official planners should be performing, and we suggest it as a far more effective model for the type of urban rail study this community actually should be supporting. Central Austin Combined Planning Area. Map: CANPAC. These neighborhood associations are among the longest-established and most influential in the city. The endorsement also emphasized that, unlike the G-L corridor, Red River St. — a link in the proposed semi-official route between downtown and the Mueller redevelopment site — lacks the projected future density necessary to adequately support light rail service. In contrast, density is considerably higher along the Guadalupe-Lamar corridor, especially in the West Campus neighborhood, which ranks variously as either the third or fourth-highest density residential area of major Texas cities. CANPAC also notes that it is commissioned both by City ordinance and its own bylaws to implement Ordinance No. 040826-56, the Central Austin Combined Plan. 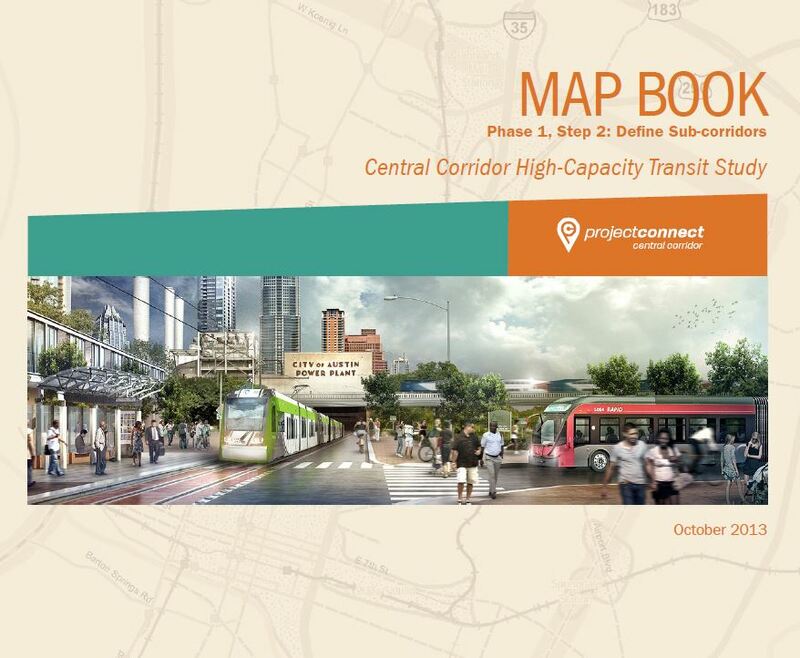 The Plan Team for the Central Austin Combined Neighborhoods Planning Area (CANPAC) has reviewed the two routes under consideration for the proposed light rail system through Central Austin, both of which pass through our combined planning area. 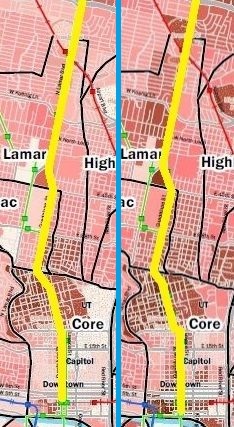 We urge that placement of the routes be made where density already exists, along the Guadalupe-Lamar Corridor, as stated in our 2004 Central Austin Combined Neighborhoods Plan, and not along Red River, which is a residential area not projected for future density adequate to support light rail. 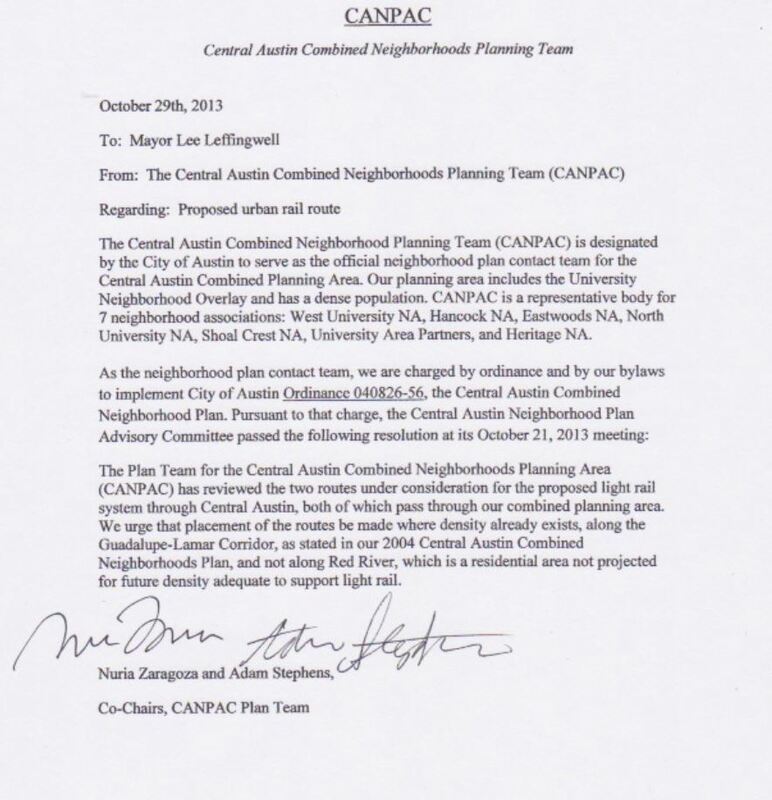 Image of memo conveying G-L endorsement from CANPAC to Austin Mayor Leffingwell. 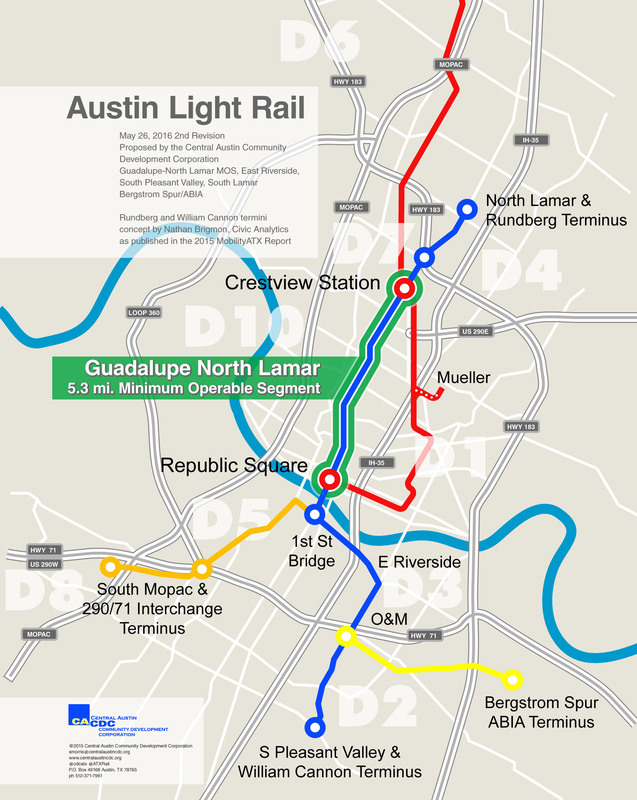 This is an extremely important endorsement of central Austin’s most important potential corridor for urban rail, and G-L supporters are strongly urged to convey news of this and other major endorsements to the Austin City Council and other important political and civic leaders. Cover of Project Connect’s Map Book version 4. Screen capture: L. Henry. 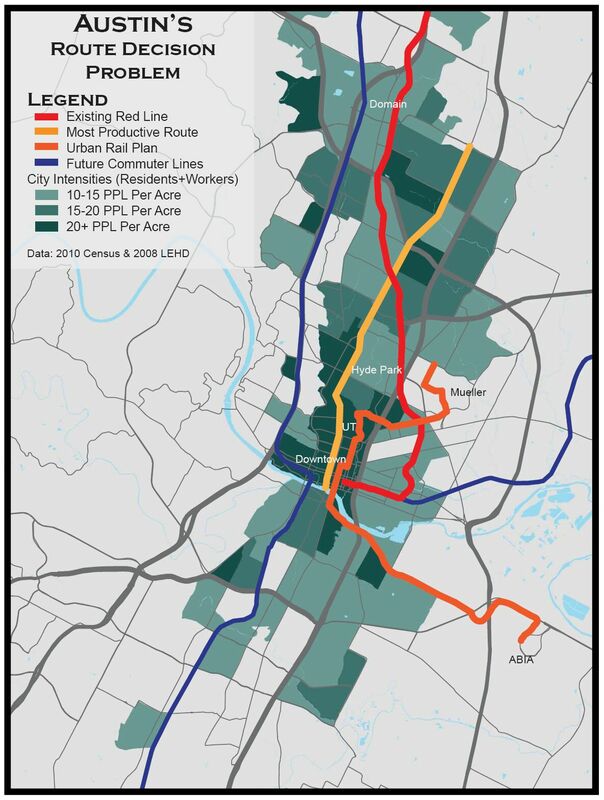 One of the most serious flaws in Project connect’s urban rail study process — in which top-level officials and planners are trying to rush to a selection of an Austin city sector for an urban rail starter line on or about November 15th — is problems with data inaccuracy and outright omissions. 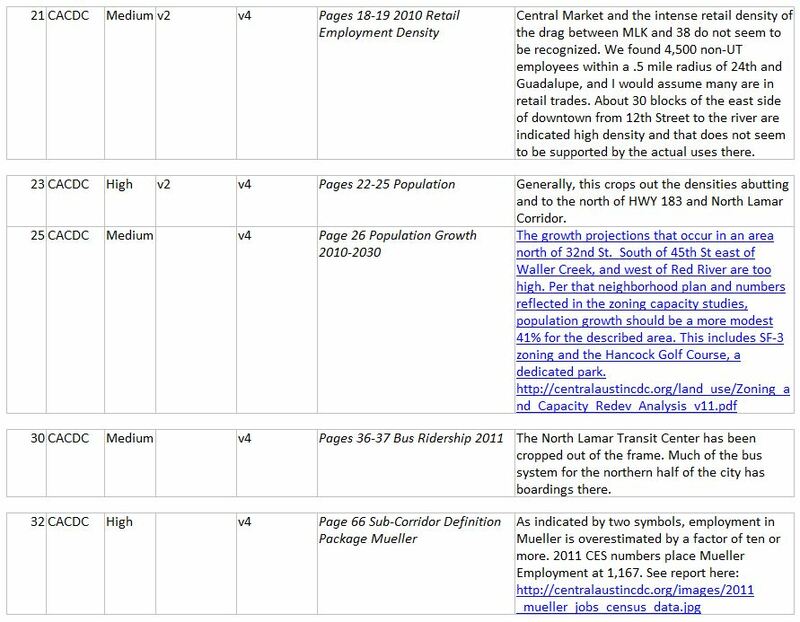 Focused on designated alternative city sectors (misnamed “sub-corridors”), the study team has been compiling purported data on demographic and transportation features of each sector (such as population, density, transit ridership, etc.) in a series of data-visualization “Map Books” (each new one an update of the previous one). 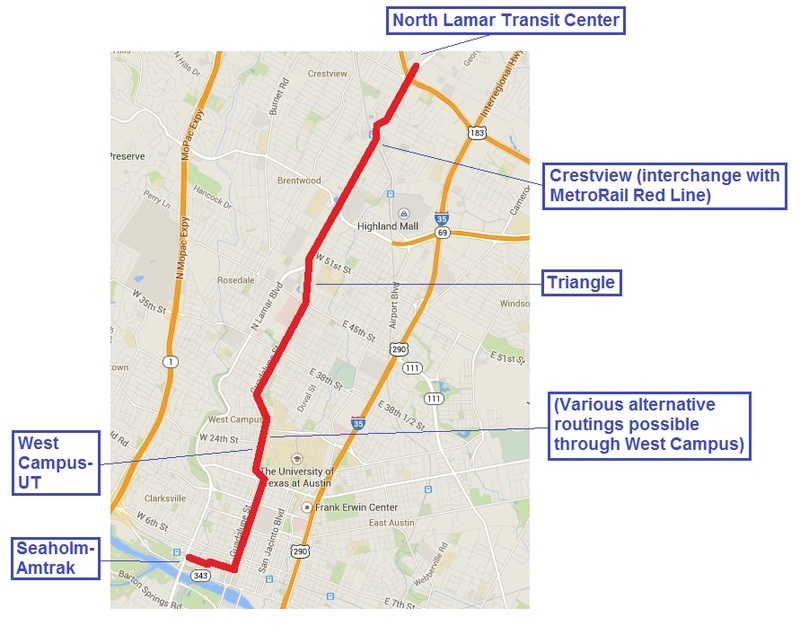 By far, as the Oct. 27th article Project Connect admits major data error in Guadalupe-Lamar corridor study highlighted, “One of the most serious data anomalies that Scott has recently detected is the “disappearance” of virtually all the ridership for Capital Metro’s routes #1M/L and #101, the heaviest-ridership transit routes in the system, serving the G-L corridor as well as South Congress.” As the article reports, Project Connect has publicly admitted that error and corrected it in the next Map Book edition. Partial listing of major errors in Project Connect Map Book and other material identified by CACDC. Screen image: L. Henry. West University NPA/University Neighborhood Overlay Removed From Defined Sub-Corridors A large, dense city area to the west of the UT campus and Guadalupe Street was moved out of the North Lamar and Mopac Sub-Corridors by the Project Team in response to a request to include UT in the core. This change was made in the current map. We understand the reasoning in placing UT in the core, however the manner in which surrounding non-UT areas were moved with it will create large, unintended impacts on the sub-corridor evaluation process. That area is not a part of UT, nor in the opinion of West Campus residents, can it be adequately served by a San Jacinto alignment on the UT Campus. West University is the densest planning area of our city that also employs over 5,000 people (Non-UT). The area west of Guadalupe anchors the Guadalupe-North Lamar Sub-Corridor and includes the University Neighborhood Overlay and 3 residential neighborhoods that are components of a City of Austin Central Austin Combined Neighborhood Planning Area. West Campus is the largest population differentiator in our city for the purposes of sub-corridor analysis. In our opinion, it should not be considered a common element to the core joining the CBD, UT, and the Capitol Complex, unless it receives a similar commitment to service. In the end, if it is desired to count West Campus as part of the core, we should also count on serving it directly as part of the definition of the core. The State of Texas in the North Austin Complex has been omitted. It is the center of over 16,000 jobs within a 1/2 mile radius of 49th and N. Lamar. There is no purple symbol. Girling Healthcare is a small office, yet shows 2,225 employees in place of the TX Dept of Health. Hundreds of units of affordable housing in West Campus is not identified with the correctly-sized circle. The North Lamar Transit Center has been cropped out of the frame. Much of the bus system for the northern half of the city has boardings there. Population Studies are not provided for North Lamar sub-corridor definition package. Austin State Hospital should show >100% Growth. This is an identified P3. The Triangle is not identified as retail density. 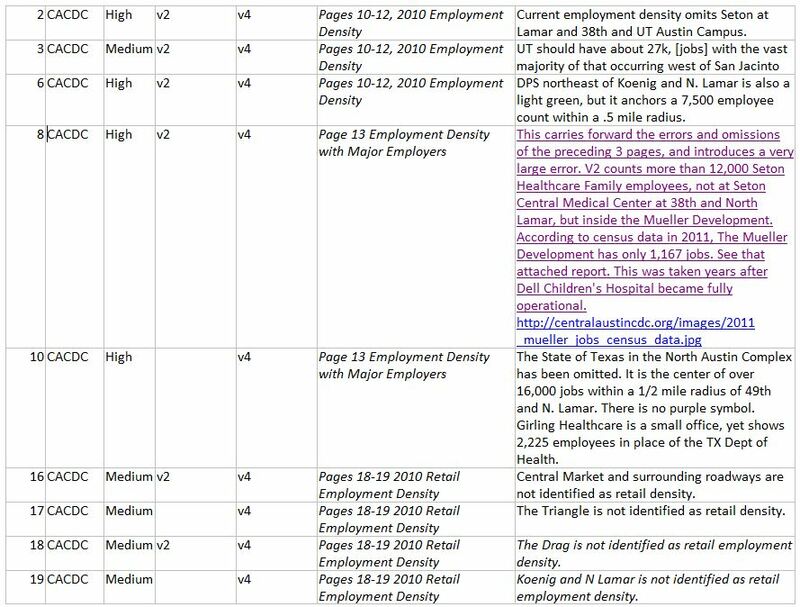 Koenig and N Lamar is not identified as retail employment density. Adams Hemphill Park straddling 30th not identified as open space. CACDC also provides data references as the basis for these corrections. It’s understandable that some data problems will be encountered in almost any major study of this kind. What’s astounding, however, is the high number of problems in Project Connect’s urban rail study. Even worse is that almost all of them — even when identified — seem to be going uncorrected! This seriously compromises the competency of this entire study process (and there are even more fundamental issues involved, as this blog will address). The data problem is especially threatening because data analysis is supposedly the foundation for decisionmaking to select an urban rail corridor; the Central Corridor Advisory Group (CCAG, whose recommendation is a key part of the process) is being led through a process of data scrutiny and analysis by Project Connect staff. Yet the Project Connect team — under duress from high-level local officials eager to force a quick decision on urban rail, and apparently overwhelmed by the need to rush to an imminent recommendation for the Austin City Council — seem merely to be “dumping” volumes of data with little regard for its reliability or relevance to the basic goal of selecting an urban rail route. All of this calls into question just how “fair and balanced” — and accurate, reliable, and truly data-based — the process of comparatively evaluating alternative urban rail corridors and plans actually is. What the final outcome will be, and whether its integrity will be accepted by the Austin public and voters in particular, remains to be seen. 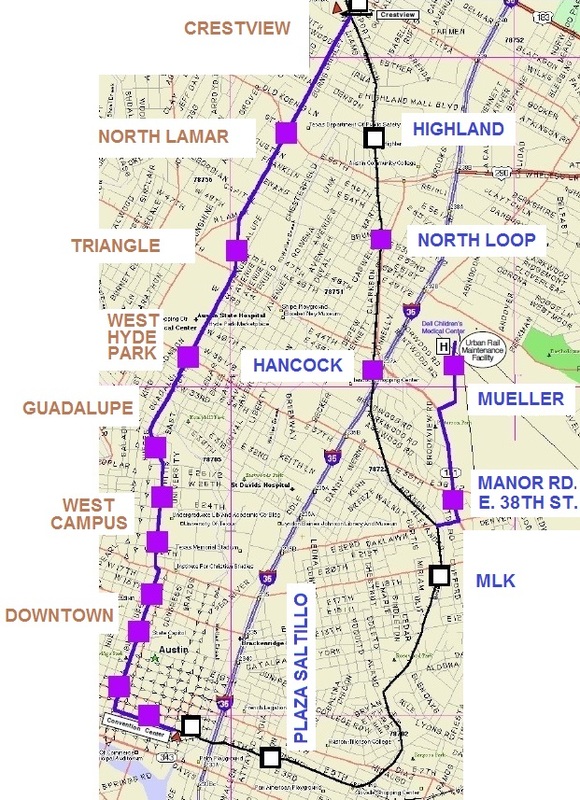 In early 2012, Jeff Wood, a top planner and analyst for Reconnecting America in Oakland, California (and former Austinite and UT student), prepared and posted on his own website several maps utilizing recent demographic data to compare the City of Austin’s Urban Rail plan with an alternative Urban Rail line in the Lamar-Guadalupe corridor. As the map above shows, the results are stunning. 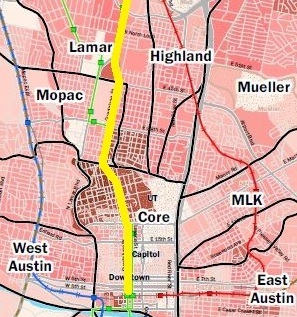 While the map shows the COA’s entire Urban Rail plan in orange (which includes a route out the Riverside corridor to the ABIA Airport), it’s clear that the proposed starter line from downtown to Mueller serves significantly lower density on the whole than the Lamar-Guadalupe line (shown in gold/yellow), which consistently serves much higher population densities (including the West Campus neighborhood, with the 4th-highest residential density in Texas). We’ll have more detailed analysis of Jeff’s demographic results in subsequent postings. Did Austin’s new Smart Mobility agenda kill light rail?